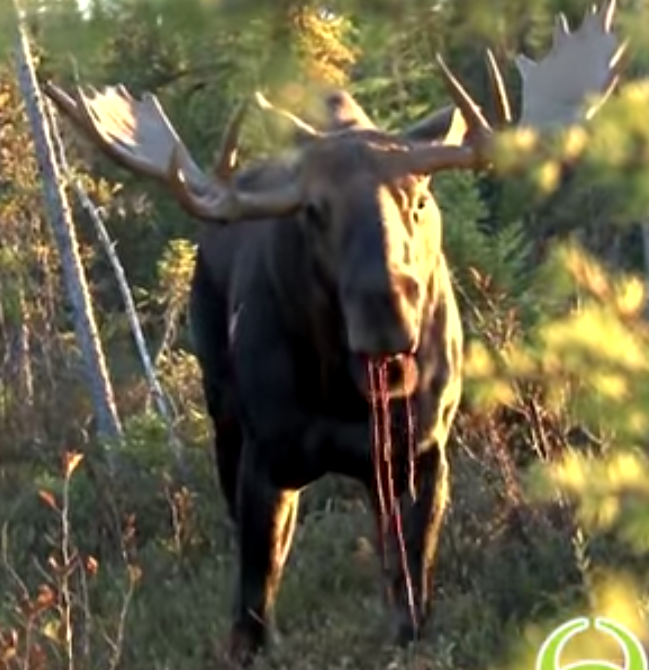 What might cause a massive blood stream from a lethally hit moose's mouth? I've recently watched a commercial videos for a broadhead model. A guy brought down a massive moose bull with a compound bow. Despite going down really fast, the bull does something which I've never seen or experienced before. It starts to gag a lot of blood! The arrow hits the animal and a few seconds later a massive blood stream comes out of the game's mouth. What causes this massive bloodstream? A normally lethal shot with a bow hits both lungs and possibly the heart. This shot was interesting because the arrow didn't go very far in and probably only hit one lung. I haven't hunted moose, but have shot elk, and most of my shots go completely through the animal. Sometimes a bone gets in the way and if you watch the arrow in the video right after it impacts, there is still a good deal of shaft left exposed and the nock end seems to immediately get levered to the front of the moose. This is probably because the shot entered just behind the leg/shoulder structure. As the leg levered the arrow around, the broadhead that is inside the animal should cut a huge swath of tissue causing a good amount of bleeding inside the lung. The shallow hit on an animal that size probably means a bone strike and it didn't get both lungs, but the one lung that is hit was cut open internally. Lung shots do two things to the animal, the first is that the blood loss from the wound can be significant because of the amount of blood that flows through the lungs. The other effect is immobilizing the lungs and making them stop oxygenating the blood by filling the lung cavity with blood or with air that leaks out of the lung hole (called a tension pnuemothorax). The elk I have seen that have been lung shot wind-down just like this one did in the video. If you are tracking a wounded deer/elk/moose and suspect this type of wound and dying pattern, you can get tricked by the track they make because as they die, they get weaker and possibly dizzy. If you start to track them up a hill and the track suddenly dies, backtrack downhill or through the path of least resistance and you will often find your animal. You will often see pinkish tissue in the blood trail at some point where bits of the shredded lung are blown out through the mouth, and this lets you know you probably had a good lung shot. On the other hand, a heart shot will stop the blood pumping fairly quickly and there will be less blood to track, but shorter trail to follow. The first elk I ever shot I punched right through the shoulder blade and had a somewhat shallow strike. I watched the elk run off with the arrow flagging just like the one in the video here. The elk ran up a hill a few yards and just fell down stone dead. When I opened the chest cavity, the moving broadhead had severed the aorta right off the heart and made for a very quick death and no tracking required. Not the answer you're looking for? Browse other questions tagged hunting animal-behaviour or ask your own question. Are fixed or mechanical blades better for moose hunting? What to bring into a tree stand? Would a scope from an air gun work on a “real” gun? What are Miner bees, and how do they differ from other bees? How would you protect yourself from Rocky Mountain Goats? How do you remove a bullet from a cartridge? What is pelt sealing and why is it required for certain species? What most common factors cause significant fluctuations in numbers of ticks that carry Lyme Disease? Is it likely that decimation of its suburban forest habitat would cause a black bear to wander into a busy city if it wouldn't otherwise go there? What UK carnivores might I find up mountains?